Our Gravity 19mm acrylic or 18mm MFC range of bedroom unit doors are available made to measure and can be dispatched on our super fast express dispatch service in 10 working days from order. Our wardrobe doors are the perfect way to complete an ultra modern, clean and stylish look to your bedroom design. From laminate doors to wooden wardrobe doors, our bedroom doors and accessories are made using an ultra gloss acrylic coat and modern durable matt MFC finishes. Choose from a matching edge, glass effect or brushed steel edge on each door. 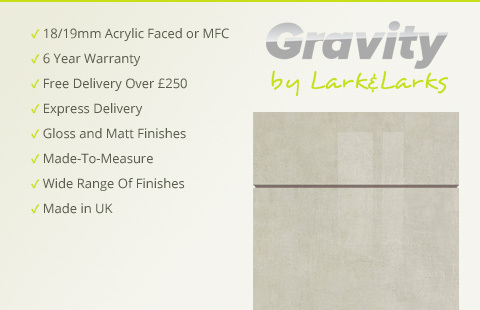 All Gravity bedroom wardrobe doors and accessories come with a 6-year guarantee.